Professional golf legend Billy Casper passed away on February 7, 2015 at 4:45 p.m. MT of a heart attack at the age of 83 surrounded by family at home outside Salt Lake City, Utah. Born William Earl Casper, Jr. on June 24, 1931 in San Diego to Billy and Isabelle Florence Casper, he started playing golf at age four and had to choose between his talent on the links and the baseball diamond. Focusing on golf, Casper attended the University of Notre Dame on a golf scholarship in 1950. He enlisted in the U.S. Navy, serving until 1955 and playing on its golf team. A two-time U.S. Open winner (Winged Foot, 1959; Olympic Club, 1966) and Masters champion (1970), Casper's PGA TOUR record is one of the most prolific. His 51 victories are surpassed by only a select few and he won at least one tournament in 16 consecutive years (1956-1971). Casper won nine times on the Senior PGA TOUR, including the U.S. Senior Open (Hazeltine, 1983). Commonly referred to as the best putter on the planet, he played on eight consecutive Ryder Cup teams amassing more points (23.5) than any other American. He won the Vardon Trophy five times and was inducted into the World Golf Hall of Fame in 1978 and the PGA Hall of Fame in 1982. Sports Illustrated named Casper one of the Top 20 players in the history of golf. Casper's strong faith as a member of The Church of Jesus Christ of Latter-day Saints led him tour the world for charitable causes, focusing on the betterment of youth. "My goal in life is to help my fellow man and touch people's lives in a positive way wherever I go. I believe that youngsters, the future of our great country, are our most precious commodities. Through golf, they learn the importance of discipline, family and invaluable life skills necessary to compete in an ever-changing world. In 1992, Casper founded the Billy Casper Youth Foundation and for more than 20 years hosted the annual Billy's Kids Golf Classic and Corporate Cup at San Diego Country Club. The tournament raised more than $3,000,000 for the Boys and Girls Clubs of San Diego, Junior Achievement of San Diego, the Down Syndrome Connection; the San Diego Junior Golf Association and other non-profit organizations. You never expect anything like this, and when you take a look at those who have been named before me on this award, it is truly humbling. I think how fortunate a person is to have a skill that gives one the opportunity to travel and build relationships with so many people around the world. During his heyday, Casper toured Asia in support of American troops. He also played golf with several U.S. presidents as well as kings, princes and other royalty and dignitaries worldwide. Playing in the Hassan II Golf Trophy in Morocco at the invitation of the king for more than three decades, Casper was proclaimed the country's official golf ambassador, helping spur significant growth of the game among juniors. 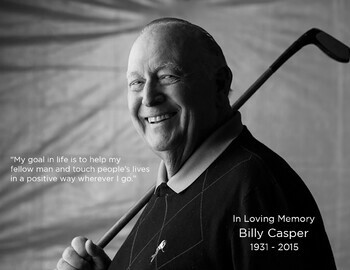 Casper's extended family includes more than 7,600 employees of Billy Casper Golf, founded more than 20 years ago. The company is the largest owner-operator of golf courses, country clubs and resorts in the U.S.